“About a year ago, I was a very small girl with very long blue hair. Imagine Dragons; they’ve made me a better performer. This is a big dream for a girl who was once their opening act,” quipped Halsey (an anagram of her real name Ashley Frangipane), about midway through her hour-long performance. 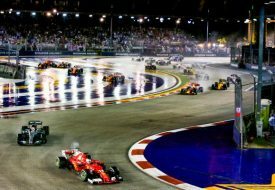 Her heartfelt confession cemented her sincere performance at the Formula 1 Singapore Airlines Singapore Grand Prix. Dressed in a yellow romper patterned with psychedelic floral prints, she cut a petite figure, although her beautifully raspy voice more than made up for her stage presence. A far cry from her blue-haired days, the now brunette singer has grown into a full-fledged performer with mature vocals. As she made her appearance, the frenzied screams from audience turned into mouthed lyrics to “Gasoline”. Building on the slow but mounting momentum, she wasted no time in belting out the songs in her Badlands album, such as “Hold Me Down” and “Castle”. “Castle”, best known as the soundtrack to the 2016 film “The Huntsman: Winter’s War, showed off her singing prowess wonderfully. In between her brooding but nonetheless memorable numbers, she spared no effort in interacting with the audience. Before she sang the emotional “Drive”, she asked that the audience switch on their cell phone lights, turning the sea of people into a glittering night sky. Suddenly, the lyrics “All we do is drive/All we do is think about the feelings that we hide/All we do is sit in silence waiting for a sign” felt particularly meaningful and relatable. Soon after, she brought the energy right back with a yelling match between her fans from both sides of the stage. “I need to see which side is louder!” She purred cheekily. As if to reward the audience for their enthusiasm, she treated everyone with a stellar rendition of “Ghost”. “When I was 19, I wrote my very first song”, she said in reference to the upbeat ballad, which gained her attention, resulting in her signing with the Astralwerks record label. As the chorus “My ghost/Where’d you go?/I can’t find you in the body sleeping next to me” came on, Halsey’s performance edged towards its climax. Sweet yet heart-breaking all the same, her rendition left us with goose bumps. For a fitting finale, she chose to end her concert with crowd-pleasers “Closer” and “Colours”. “Closer”, the hit song by American DJ Duo Chainsmokers featuring Halsey, got the audience bopping their heads and screaming to the lyrics “So baby pull me closer/In the backseat of your Rover”. 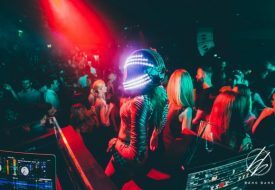 By the time “Colours” came on, the gyrating bodies in the crowd were swaying as one as Halsey’s slick performance came to a reluctant closure. It was truly a night to remember. 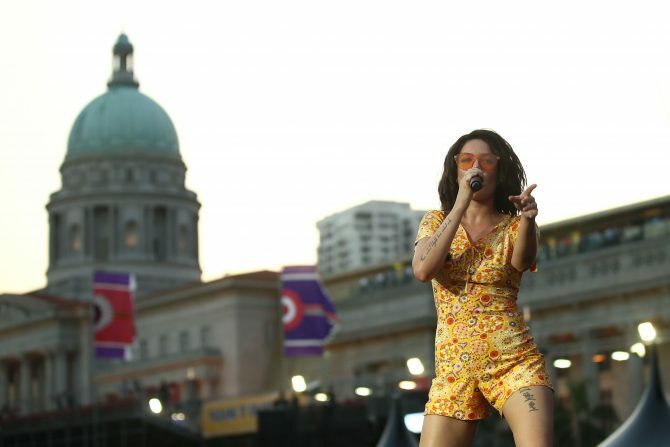 Halsey performed for the Singapore Grand Prix on 18 Sep at the Padang Stage.